The Aerial Photograph of the Hamlets area and Carman's River in the original printed study document was not reproducible. This photograph presents a somewhat different view. Brookhaven Hamlet is lower left center. 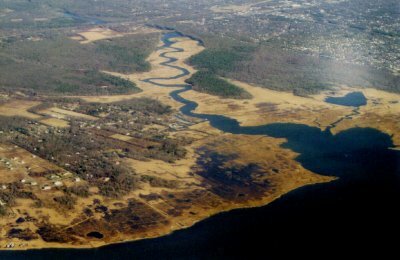 South Haven Hamlet is upper left center; the large forested area in South Haven being mostly the Wertheim National Wildlife Refuge. The Carman's River flows from South Haven (and further northward) to Fire Place Bay (at bottom). Mastic Neck and Shirley is to the right (east) of the Carman's River, and is not included in the study area.